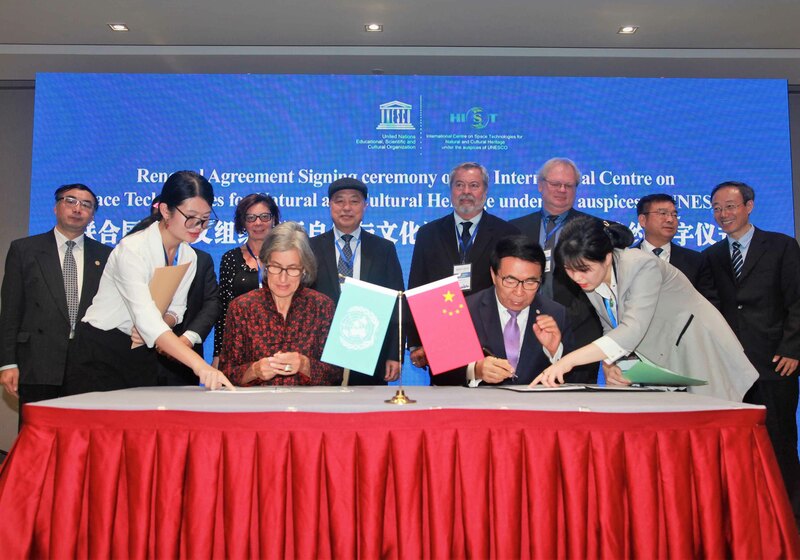 On behalf of the Chinese Government and the United Nation’s Educational, Scientific and Cultural Organization (UNESCO) respectively, CAS President BAI Chunli and Dr. Flavia Schlegel, Assistant Director-General for Natural Sciences of UNESCO, signed the second-term (2018-2023) cooperation agreement on the International Centre on Space Technologies for Natural and Cultural Heritage (HIST) in Beijing on Nov 4. 2018. Bai spoke highly of the remarkable achievements made by HIST during its first term, especially in S&T collaborations in Southeast Asia. He urged HIST to make even greater contributions to assisting developing countries in the Belt and Road region in their protection and management of world heritages, world biosphere and world geological parks. As a category-II center under the auspices of UNESCO, HIST was established in July 2011.Hosted by the former CAS Institute of Remote Sensing and Digital Earth (now the Aerospace Information Research Institute of the Chinese Academy of Science), it is the first UNESCO center applying space technologies to the monitoring and conservation of world natural and cultural heritage sites. Over the years, HIST has conducted cooperative projects on world heritage sites with various countries, including Cambodia, Sri Lanka, Solomon Islands, Italy and Tunisia. It also conducted training for managerial staff of world heritage sites of Asia and less developed countries in Asia and Africa. Address: Beijing city Haidian District Dengzhuang Road No. 9 100094 Email:office@unesco-hist.org.